The Pre battery has never been a strong point. 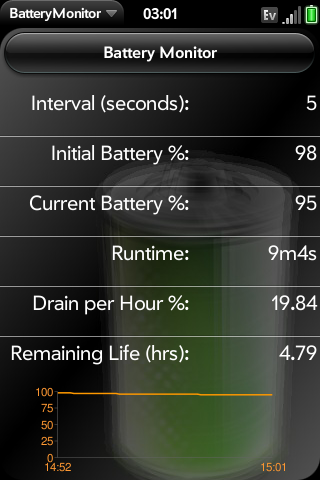 As a result, there has been a good deal of guess work on battery life based on configurations. Should I turn off my GPS, should I keep AIM offline, should I keep my cards open, or close them? There really isn't a good way to determine this right now. And what about new OS versions? Most people can only say it seems better. What BatteryMonitor does is it tracks battery usage over time. Using this tracked information, it can guess how much battery you lose per hour, how much time you have left, as well as illustrate your battery usage in a graph. Because the application polls for battery life over time, it may take long periods of time before the data normalizes to a proper level. To read more, visit the precentral forums or my blog at www.futurepr0n.com! If you find my applications useful, please show your support and donate, thanks!